The Goat Shed is a traditional Savoyarde village property, which has been lovingly renovated, to provide a cosy and comfortable base for your holiday. The chalet has five comfortable bedrooms. Three rooms have en suite facilities and two rooms share a bathroom. There is a large open-plan living area with a log-burner, widescreen TV, DVD, Playstation 3, WIFI internet and a laptop for your use. We have a huge selection of films and games, and of course you can bring along your own. On the ground floor is a ski store/tech room and heated boot room. In the summer this area is magically transformed in to secure bike storage, a workshop and drying room. Our catered holidays include breakfast, afternoon tea, and for 6 nights of the week Gordon prepares a delicious three course evening meal served with local wines. 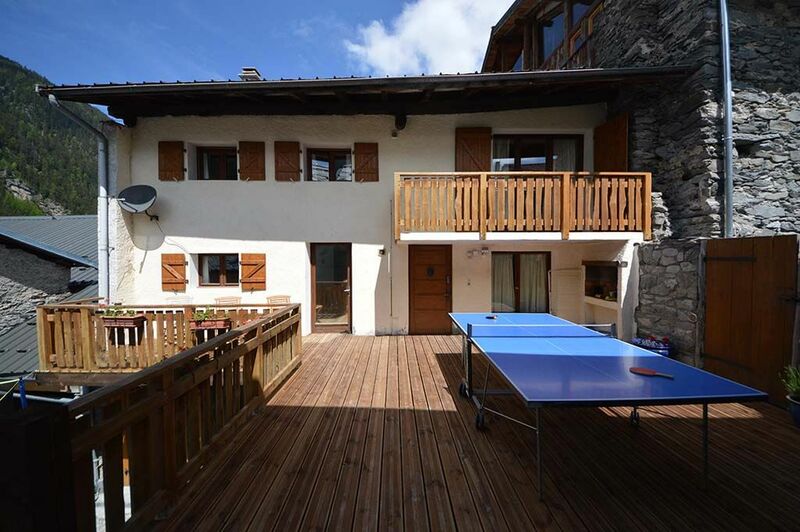 The chalet is situated in the picturesque village of Peisey. The village centre is 10 mins walk, where you can find a small selection of shops, bars and restaurants. Peisey is linked to the main ski area by an open-air cable car, which is a 3 minute bus ride from the chalet on the free resort shuttle. Our catered chalet guests can take advantage of our courtesy minibus, which can take you straight to the piste and the Vanoise Express in 5 mins.